International consensus. Acellular matrices for the treatment of wounds. An expert working group review. Wounds lntemational, 2010. Our people are committed to developing products that improve wound management and healing. We are producing man-made devices that replace the skins natural scaffold: the extra-cellular matrix. 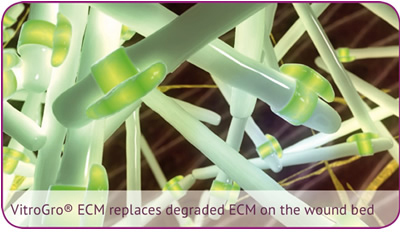 VitroGro® ECM is a scaffold comprising a synthetic extra-cellular matrix protein. When applied, it replaces a dysfunctional wound matrix by forming a scaffold that helps restore the wound healing process. VitroGro® ECM is intended for the treatment of hard to heal wounds, primarily venous ulcers, and may be used in conjunction with standard wound care including compression bandaging. 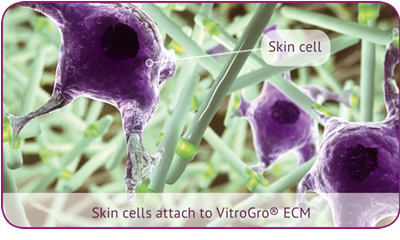 VitroGro® ECM facilitates wound closure and may improve wound care by reducing pain.